This year one of my beloved friends who is traveling the world right now came back to Germany for few weeks. We had wonderful idea to cook together some Israeli food, as her boyfriend Adi comes from Israel and likes cooking! I remember when she told me on the phone that one of the dishes we will be cooking is traditional Israeli falafel. I have never eaten falafel before. Why would I? While eating street food I always choose something with meat. Falafel sound to me far too vegetarian. But I was very positive about us cooking this, because food cooked with love will be tasting better then from any Kebab place here in Germany. And I wasnt disappointed. Homemade falafel among with pita bread, homemade Israeli hummus and tabbouleh salad was amazing. Falafel became one of my favorite vegetarian dishes and hummus that Adi made was the best we have ever eaten. Put chick peas in the cold water for 12 hours. Drain them. Put parsley, corriander, zucchini, potato, garlic, cumin and salt in the food processor and turn it on. The mixture should have consistence of a couscous paste. If its too thick, add some water. Don't overprocess it! Transform the mixture to the bowl, mix in breadcrumbs, baking soda and seasame, try it and season with salt and pepper if needed. Form flat balls with wet hands. Fry the bowls from both sides until dark brown. Drain on paper towels. 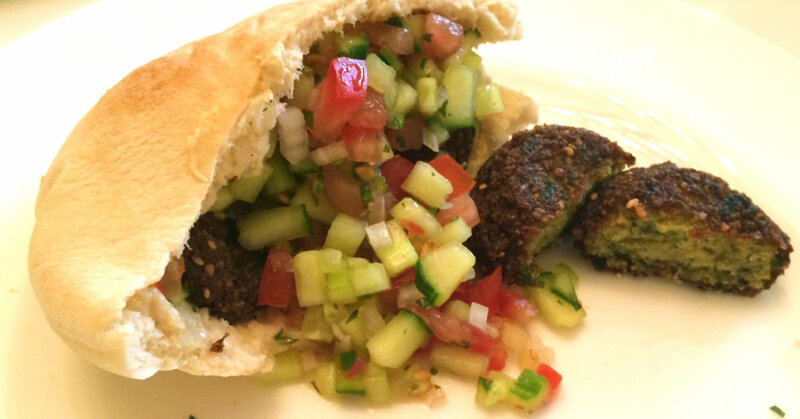 Stuff half a pita with falafel, taboulah and pickled turnips. Drizzle with tahina sauce.